About 5 years ago, I found myself newly entrenched into the world of self and personal development. As part of that process, I made a commitment to myself to “stay out of family drama” and to avoid any conflict in which I wasn’t directly involved. Up until that commitment I was often the go-between between different “factions” within the family. Some might say that I was being the “mediator,” but I know that isn’t true because I wasn’t impartial, and ended up participating in the gossip and judgments as much as anyone else. In deciding to remove myself from that role, I thought that I would leave everyone better off. My family members would learn how to talk to each other, the gossiping would lessen, and I would feel more at ease during our family vacations because I wouldn’t get wrapped up in their drama. I thought it was the best way to keep my sense of integrity. This summer, though, I realized how much that commitment was not only costing me, but also costing some of the other members of my family–members of my family who didn’t yet have the skills or confidence to speak for themselves. I realized that my commitment to avoid conflict, had in fact COST ME my integrity. I want to refrain from telling too many of the details of the story, as it is not my story to tell, but I will give you the essence so that you understand how my avoidance cost me my self-respect. At first I said, “What happened?” then looked around at the faces and said, “Nevermind, I don’t want to know.” I could see it was a conflict, if only one-sided, and, as per my pact to myself, I did not want to insert myself into the middle. A week or so later, one of my sisters asked me about my choice to stay out of family conflicts. After I shared my perspective and my reasoning, I asked her what I had missed. It was in that moment, that I realized the “error” of my commitment, or at least the “error” of it in today’s family dynamics. In making the original commitment, I had thought that I was giving my family members an opportunity to stand on their own, to resolve their own conflicts, and to find peace without me. Yet, I hadn’t ensured that they had the tools to do so. For them I was that tool, no matter how judgmental I had been in the process. When I learned more about the incident this summer, I came to see that my commitment to avoid conflict, had left the younger and more vulnerable members of my family in harm’s way. Unintentional emotional harm, but harm nonetheless. Not only did my commitment to avoid conflict cost me my integrity and self-respect, but it also cost something greater for my younger family member. I wasn’t modeling for them. I wasn’t teaching them. I wasn’t inspiring them to stand up in a way that doesn’t damage the relationship–in a way that builds bridges instead of walls. I had left them to fend for themselves and they weren’t ready. When I think of that cost, it breaks my heart. 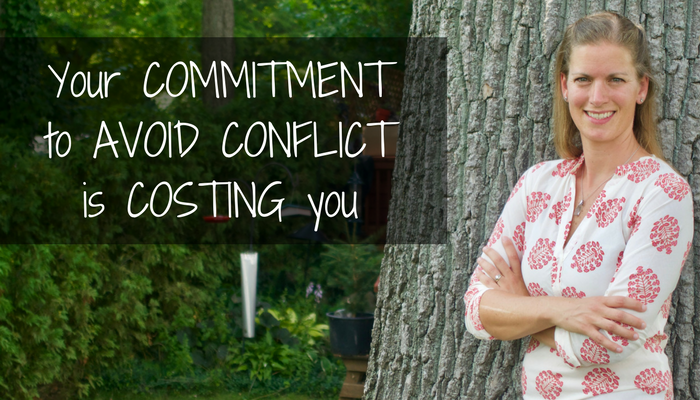 If you, too, are avoiding conflict for greater ease, please know that there is a cost, and that cost ripples out beyond you and into the people you love. Is your ease, worth their pain? I support people to transform feelings of powerlessness to feeling powerful after a loss--a lost job, a lost relationship, a lost business, or a general lost sense of self. By blending personal development, intra and interpersonal communication skills, and conflict transformation tools, my clients develop a strength and calm, despite storms brewing around them.